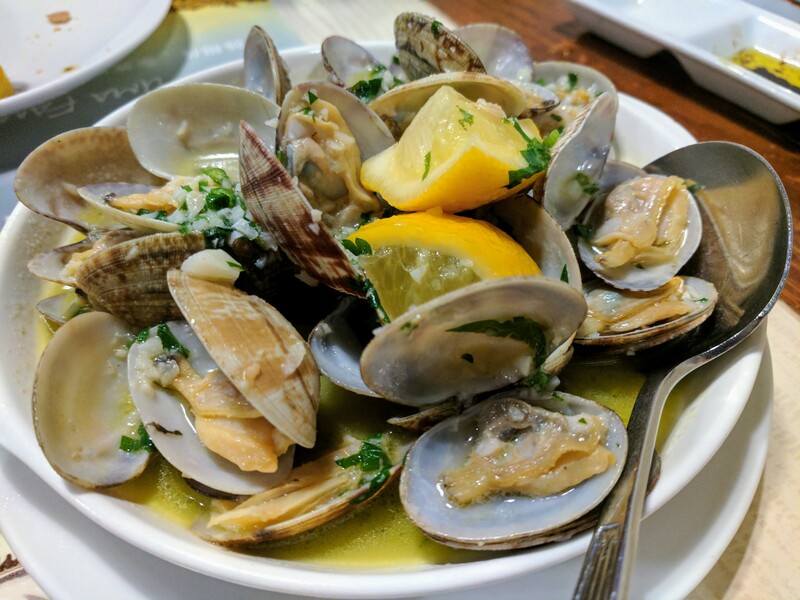 We had a classic Portuguese appetizer, which was steamed clams with wine, garlic, butter, and cilantro. There were lime wedges in the dish, which we squeezed on top of the clams! The clams were light and refreshing, a perfect starter to kick off our dinner! This Portuguese dish is named after the 19th-century Lisbon poet Bulhão Pato, a well-known gourmand, and today it is a popular first course in the capital’s many tascas and restaurantes típicos. The Spanish, of course, make a similar dish, which they call almejas a la marinera, or clams “fisherman’s style.” It might mean spicy clams cooked with tomato and onion in Galicia; the addition of red bell pepper or even carrots in Bilbao; or white wine and garlic, with a few bread crumbs for thickening the pan juices, in Andalusia.